Several years ago Mr. Waterstone and I had the pleasure of meeting another coffee fanatic lover who actually roasted his own coffee. We were so smitten with the process that we had to try it out for ourselves. Our friend quickly convinced us that the process is quite easy and the end result makes for a wonderful cup of coffee. In the past I've talked about ordering our fair trade coffee beans from a great online site called Dean's Beans. 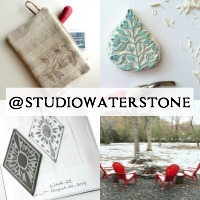 They sell fair trade products from all over the world. We ordered our I-Roast coffee roaster directly from this site. A one pound bag of green beans (photo #1 below) goes for approximately $4.50 and guess what? Once it's roasted, it becomes a two pound bag! In photo #2, you can see that the beans are actually green in the beginning. Photo #3 (above) shows what the beans look like loaded and beginning the roasting process. 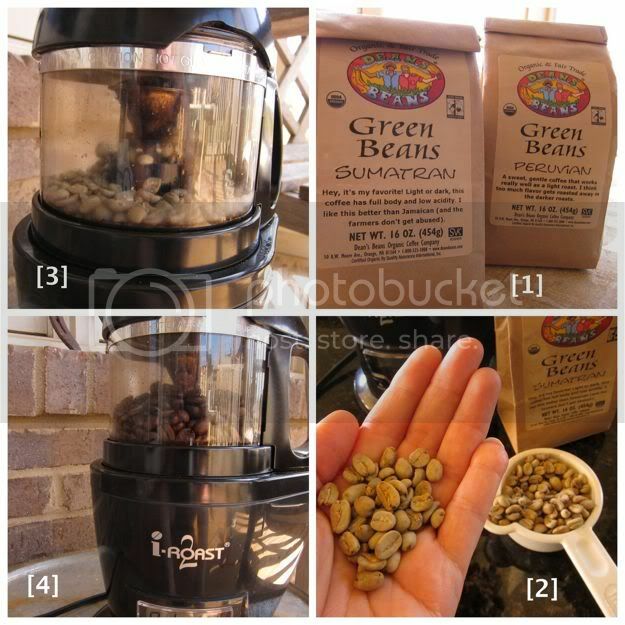 In photo #4 (above) you can see that after only 4 minutes, the beans begin to brown. After a short 5-6 minutes, the roasting is over and they begin a three minute cooling process. Because of the smoke released from the top of the roaster, it's best to roast outside. We are trying to cut back on the caffeine, so I purchase a bag of hazelnut-flavored whole beans from the grocery store (photo #1 above). In a large bowl, I combine the freshly roasted coffee beans with an equal amount of the hazelnut decaf. 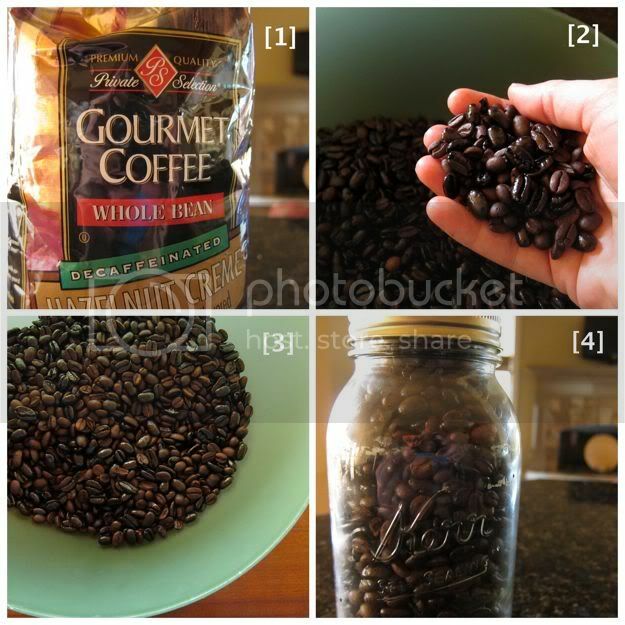 (photos 2 & 3 above) I store our mixed, freshly roasted coffee in mason jars. The aroma and taste are simply amazing. I hope that you've enjoyed my little tour or our sick coffee addicted world! Even if you don't end up roasting your own green coffee beans, be sure to visit Dean's Beans. The green beans are just a small part of what they sell and remember, they're a fair trade seller. Thats so interesting! I had no idea you could roast your own coffee. I'm afraid to tell hubby about this! You should hear the kids imitate him ordering coffee at Starbucks: half-caf, decaf, caf, caf, caf! Thanks for the information! I did not know you could roast your own coffee. It had never occurred to me that you can purchase green coffee beans -- I always just assumed you grew them yourself or you were out of luck! I'm officially intrigued! We brew our own beer and bake our own bread... coffee might be next on the list! mmmm, gorgeous post! thanks for all the information! Kelley, I've never thought of doing that with the beans - great idea! Mmmmm, and even though it is 90° i.want.coffee! Happy tuesday! Wow, that looks soooo yummy. I didn't even know you could roast your own beans! Well you learn something new everyday ! I didn't even know you could roast coffee at home !Awesome ! Julia, I have heard that you should store it in a dark place. I would think that means over a longer period of time and our beans last just over a week. So I'm not sure that it applies. I do store the unroasted (green) beans in the freezer to keep fresh until roasted. Then the roasted beans go in a dark drawer. I guess that applies. Good question! I gave this a try one summer. I wasn't consistent and finally decided i wasn't going to do it anymore. I came across a Brazilian Coffee that was the best coffee in the whole wide world. Too bad the place I bought the beans from switched out and I couldn't find it anywhere.